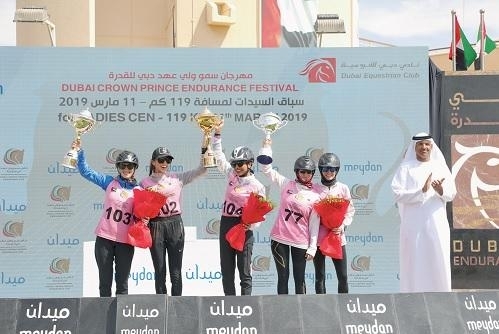 Keen to do their boss proud, F3 Stables’ riders struck it rich in the opening event of the Dubai Crown Prince Festival held at the Dubai International Endurance City, winning the CEN 119km Ladies Ride with a top two placing. The Dubai Crown Prince Festival is in its 11th year and is being conducted under the aegis of HH Sheikh Hamdan bin Mohammed Al Maktoum. And riding for his F3 Stables, Aya Abdulla Redha Ishaq Ali laid the rest of the competition low as she stormed to victory aboard 11yo chestnut mare Utoufa De Lap in 4 hours 4 minutes and 45 seconds to place ahead of her Uruguayan teammate Cecilia Garcia, who was clocked at 4:05:13 aboard Toufka La Majorie. Aya paced herself well on the Ali Ghanim Mohammed Al Marri-trained Utoufa De Lap and kept close to the summit from the outset. She was placed third through the first three laps and was happy to hold onto her spot before making a charge in the final phase. A total of 178 riders from 36 countries participated in the event, which saw 84 finish. Spelanzon led over the first two stages of 40km and 35km respectively, M7 Endurance Stables’ Spanish rider looking comfortable on Awarran Park Star Shadow. However, in a bid to ride within parameters she was forced to reduce her speed over the third loop and dropped to seventh, being replaced by countrywoman and M7 teammate Naroa Calvo Ibanez aboard Ghazi. With Ibanez and Ghazi stuttering and failing to complete the fourth stage over 18km, the door swung open for the rest of the pack. Aya was 21s off the pace going into the fourth and final loop but in a stage that is often considered a sprint, she, like the rest of her rivals, upped the pace several notches going from 27.91kph to 35.41kph. The result was obvious as she overtook Garcia, who had been second since the end of the second phase, to win by 20s. Spelanzon worked her way up from seventh but could only manage a third, while F3 Stables’ McAuley took fourth, ahead of Mira Jasim Mohammed Al Ansaari, who was fifth aboard Al Bawadi Stables-owned Arizona De Sau with a time of 4:09:23. The second event of the festival was the Private Stables ride, which was held a day later on Tuesday and was won by Zabeel Stables rider Abdulla Ghanim Al Marri with a time of 4:14.25 aboard EO Rakassah Anik. In second place was Ahmad Saleh Al Shehhi on Al Kamda Endurance Stables’ Jabulani Endurance, with Zabeel Stables’ Mohammed Ahmad Al Marri third on Heathfield’s Mishka. The feature event of the festival, the CEN 119km Dubai Crown Prince Endurance Cup will be held on Saturday at DIEC.